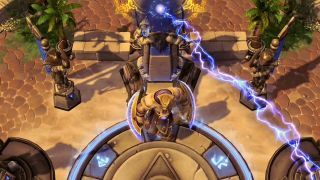 Blizzard announced at BlizzCon today that Heroes of the Storm, its upcoming entry into the hyper-competitive MOBA genre, will go into closed beta in January 2015. The studio also released a swanky new trailer showing off new features, battlegrounds, and characters—including a familiar trio of Norsemen. That's right, The Lost Vikings are back in action, rowing into battle aboard a floating longboat. Jaina and Thrall make appearances in the video as well, which also shows off a couple of new battlegrounds—Sky Temple and Tomb of the Spider Queen—and support for ranked play and a pile of new skins. The biggest news, though, was the announcement of the beta start date: January 13, 2015. It's a closed beta, so entry isn't guaranteed, but you can put your name in the hat now at Battle.net.